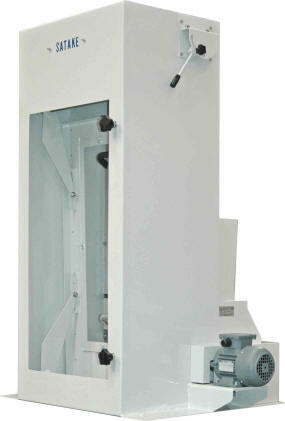 The Leg Aspirator SLAA is ideally suited for use in grain and pulse intake and grain and pulse cleaning plants. It is available as a ‘stand alone’ aspirator or may be used in conjunction with other Satake separators, debranners or scourers. The material to be aspirated is fed onto the vibrating feed tray. The weight of the stock on the feed tray pushes against an adjustable spring balance mechanism. This causes the tray to move downwards allowing a thin uniform curtain of stock to be fed into the aspiration channel. Here a completely adjustable stream of air passes upwards through the stock and lifts the light undesirable impurities. These impurities are aspirated away through the upper outlet to the external exhaust system. The heavier cleaned product falls to the bottom of the machine. The intensity of aspiration can easily be seen through the full size illuminated window.